Visual analog scale (VAS) and its corresponding visual analog pain scale, is a psychometric scale that is generally used in hospitals and clinics by doctors to conduct pain scale surveys to understand varying degrees of pain or discomfort experienced by a patient. What is Visual Analog Scale (VAS)? Visual Analog Scale, also referred to as Visual "Analogue" Scale, is a psychometric scale that is generally used in pain scale surveys to understand varying degrees of pain experienced by a patient. Alternatively, it is also used in surveys to measure characteristics and attitude across a range of continuous values. It’s comparable to other linear scales like the Likert scale in terms of the results and the sensitivity of performance. Visual analog scale is frequently used in clinical or community health analysis most often to understand the gravity or frequency of certain diseases. For example, if a person suffering from pain can rate that pain from a degree ranging continuously from “no pain” to “pain as bad as it could possibly be”. This scale was essentially developed to measure the basic element in continuity for pain measurement. The usage of visual analog scale for pain measurement was reported by Woodforde and Merskey with options like “no pain” and “the pain is intolerable” as the extremes of the scale. It was first used with patients with different levels of pain and then was also used with hematology patients who were on their road to recovery by receiving pharmacologic therapy. Visual Analog scale has received a critical acclaim from the patients who’ve used it and thus, even older patients with minimum assistance are able to fill out this scale. Semantic differential (non-slider) visual analog scale: This scale consists of circles at equal distances and according to the desired option, the respondent will have to select the circle. Slider visual analog scale:Respondents can show their level of agreement using a slider which has adjectives corresponding to the matter under discussion as the two extreme ends of the scale and other intermediate terms that connect the two. 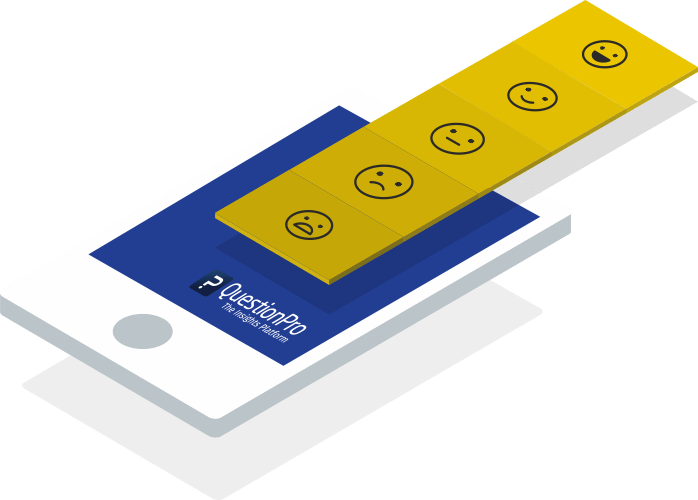 Respondents can submit precise feedback for the survey question which makes this scale highly popular with respondents and survey makers alike. Traditionally, it consists of either horizontal Visual Analog Scale or vertical Visual Analog Scale. Each end of this scale is an extreme label of the symptom that needs to be analyzed. These extreme labels may differ as for the intent of usage changes. For measurement of the magnitude of pain, the most used scale is “no pain” (corresponding to the scale of 0) and “pain too intense to be tolerated” (corresponding to the scale of 100). Intermediate numbers or pointers should be avoided in the VAS to avoid congregation. Respondents indicate their degree of acceptance to a statement by specifying a point on the continuous scale in between two endpoints. 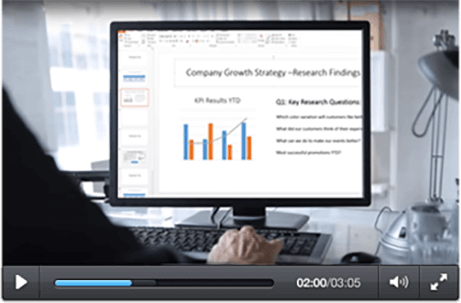 QuestionPro online survey software allows web surveys to offer continuous input tools such by providing options like the slider scale, making VAS practically possible. 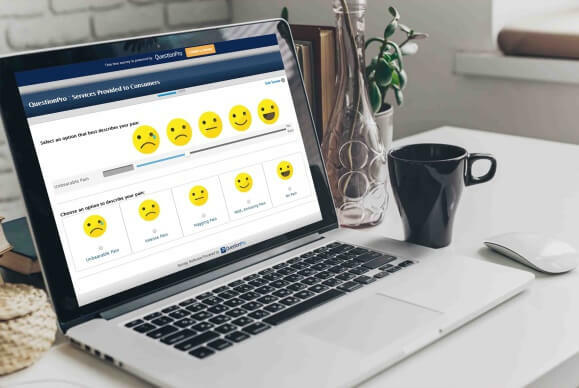 With options like the smiley scale, slider scale and the numerical scale, our software makes it easy for survey creators to implement and analyze the VAS. The collected responses are then analyzed and on the basis of the received feedback, steps for improvement can be decided. These responses are updated in real-time, as the responses keep taking the survey. Ease of use: The VAS is extremely convenient to fill out for the respondents and is extremely easy to keep track of for the survey maker. The evaluation of this scale doesn’t require technical know-how as it is just the measurement of the distance of the rating scale to calculate the score. Record the progress of the patient: It’s an extremely valuable scale to measure the improvement in a patient’s health over time. Super quick to fill out: This scale takes less than a minute to fill out. Highly reliable: VAS is extremely reliable to track a patient’s progress by conducting it before and after a surgery or therapy, especially amongst the literate patients.